Nothing can be compared to the satisfaction that you get when you bake your own Pizza from scratch at home! I mean baking the pizza base, choosing and mixing your favourite toppings, and serving it to awed people-now that is fun! 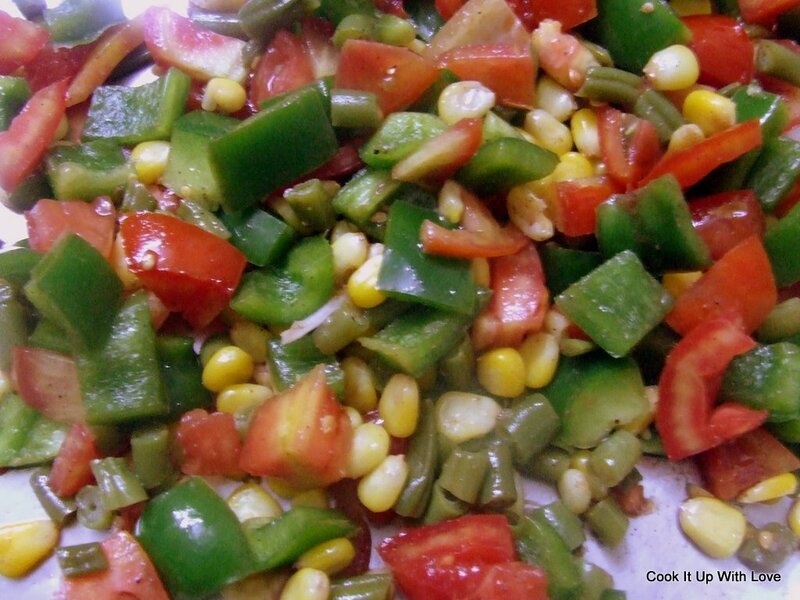 Blend these to make a puree, and cook on a wok till it thickens to make the sauce. 1/4 cup zucchini chopped and cooked. Mix the above veggies in a bowl and then add melted butter, salt and pepper to form the topping. 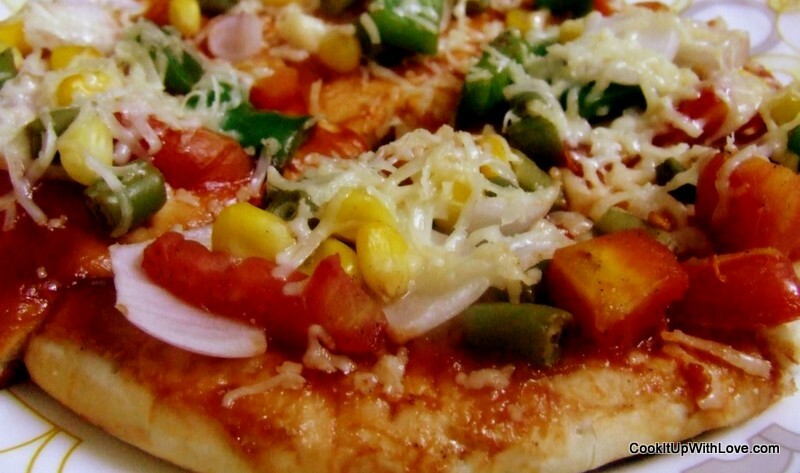 You can add whatever topping you like on pizza, like olives, jalapeños, sundried tomatoes, baby corn, mushroom,paneer etc. For preparing the pizza dough, take luke warm water in a bowl, add sugar and yeast, mix well and let it sit for around 10 minutes, till it forms froth. Then add this to the flour, and mix well. Add oil and start kneading with your hands, and continue till a smooth ball is formed. If the dough is too dry, add a little water; or if it seems too sticky add a little flour. Coat the dough with some oil and let it sit in a bowl for around an hour. After an hour the dough would have risen considerably. Knock it down, knead again and let it sit for another half hour. The dough is now ready. Make small balls out of it, and roll gently using a rolling pin on a greased surface to form the pizza base. Make holes on the base with a fork. Pre heat the oven at 200 degrees C. Place the pizza base in the oven and bake for around 5 minutes such that it gets half cooked. Now spread the sauce over the base. Sprinkle with toppings. Finally grate cheese and sprinkle on top. Place the pizza in the oven and bake for around 10-15 minutes at 200 degrees C or until the base is golden brown. Serve sprinkling freshly flaked red chillies, or pizza seasoning. The yummy fragrance that wafts out of the OTG will surely lure your neighbors too! I bet you will agree that home made pizza is much more tastier than the ones that we get at pizza houses. For health conscious people, the all purpose flour can be substituted with whole wheat flour.